Seven days a week – 8 a.m. to 7 p.m. Seven days a week – 8 a.m. to 9 p.m. Seven days a week – 8 a.m. to 8 p.m. Please stay off the landscape feature. 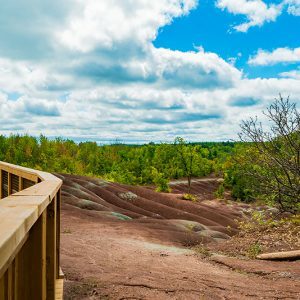 Visitors must remain on the accessible boardwalk and trails at all times to reduce damage and erosion of the historic feature. Be kind to the Badlands. You must use marked trails or the sidewalk along Olde Base Line Road to access the site. Parking is only allowed in the parking lot. There is no vehicle stopping, standing or parking permitted along the road. The accessible parking space located beside the boardwalk is for use by valid permit holders only. Please pay at the pay station. Machines accept credit and coin. * Show your receipt at any CVC parks location on the same day it’s purchased to receive a discount (equal to your Badlands receipt) off your general admission fees at other CVC parks. Bus Shuttle Service is available from 9:30 a.m. to 4:00 p.m. from Terra Cotta Conservation Area. Shuttle service is complimentary with admission to Terra Cotta CA. See FAQ at the bottom of this page for more information. Commercial buses – not permitted in the parking lot due to the size and turn radius required to exit the parking lot. School buses – accepted Monday to Friday by permit only. Not permitted any time on weekends or holidays. A permit will only be issued by CVC staff. Call 1-800-367-0890 for more information. Photography (permit may be required, please contact 1-800-367-0890 for details). CVC would like to acknowledge support provided by our partners — Ontario Heritage Trust, Region of Peel, Town of Caledon and TD Friends of the Environment Foundation. CVC would also like to acknowledge support from the Government of Ontario and the Government of Canada.